We had you at bacon coffee, we know that. Our Maple Bacon Morning coffee is more than just bacon flavored coffee though, it is one of our favorite flavored coffees. It combines the slight sweetness of maple with the smokey richness of bacon, without being overpowering. Sometimes a cup of coffee is what is for breakfast, so it should be an enjoyable experience and made with gourmet coffee beans. 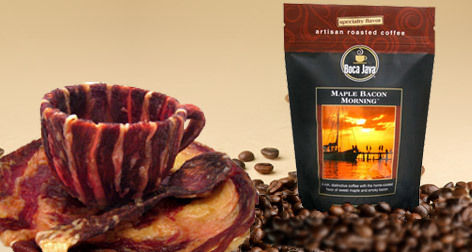 Get the aroma and taste of a delicious breakfast everyday, with or without the food, with our amazing Maple Bacon coffee.